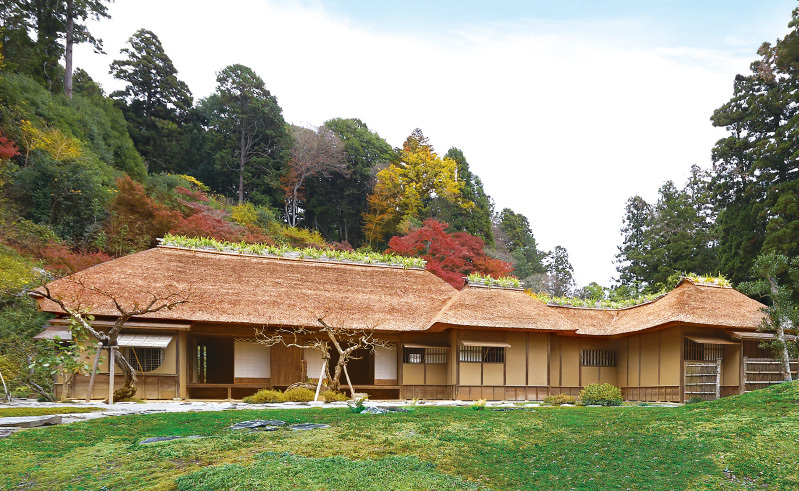 Nishiyama-Goten Heritage is a residence for Tokugawa Mitukuni’s retirement life. Tokugawa Mitukuni, grandson of Togugawa Ieyasu and the second head of Mito Tokugawa Family handed over the headship of the family to Tsunaeda, the third head of the family, in 1690. In May 1691, Mitsukuni left Edo which then was at its height of prosperity, and moved into Nishiyama-Goten. In this residence, while continuing compilation of “Dai Nihonshi”, he enjoyed the company of the people of the domain, loved by them. Mitsukuni died in this villa on December 6, 1700. Nishiyama-Goten has been preserved by the successive heads of the family to commemorate the virtue of Mitsukuni. The residence we see now consists of the residence of Mitsukuni and that of guarding officers, both of which are two-hundred-year-old buildings rebuilt in 1819 by Narinobu, the 8th head of the family. The residence and the garden have air of stateliness of a samurai’s retreat which fuses with philosophy of Mitsukuni who avoided luxury, and serenely stand the test of time keeping atmosphere of the day of Mitsukuni. The site was designated as a national historical site and place of scenic beauty in March 2016.